Dr. Tushar Ch. Patel is a board certified, fellowship trained orthopedic surgeon who specializes in spinal surgery with a concentration on conditions of the cervical spine (neck) with a particular interest in minimally invasive surgery and disc replacement. 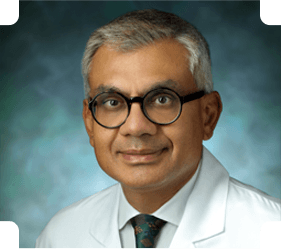 He has been in practice since 1994 having served as Chief, Section of Spine Surgery, Department of Orthopedics, Yale University School of Medicine until 2000, then in Northern Virginia until 2017. Dr. Patel’s research interests include tissue engineering, bone growth factors, and innovative techniques in spinal surgery. His research efforts have resulted in multiple peer-reviewed publications and numerous patents. He has presented extensively both nationally and internationally at the meetings of the leading societies in spinal surgery. He is currently a member of the North American Spine Society, the Cervical Spine research Society and a founding member of the Lumbar Spine Research Society. He has held multiple leadership and committee positions in these societies. His research experience, academic experience, and extensive clinical experience allow him to devise an individualized care plan to allow patients to return as rapidly as possible to a healthy active lifestyle, with surgery as a last resort. He has been recognized as a “Top Doctor” six times by the Washingtonian magazine. Dr. Patel and his wife - a transplant and heart failure cardiologist - have two boys. In his spare time, he enjoys coaching soccer, playing golf and spending time with his family.